The onnagata Hayama Ugenda is approaching Ogurayama, the country estate of the medieval poet Fujiwara no Teika (1162–1241); a page is holding an umbrella over him. This is a scene from the piece Tategami Teika kazura (“Teika in a Fashionable Hairstyle”), a parody referring to the famous classical poet, which was staged in Edo in 1719. This sheet is the only known print of the famous woodcut. Sawamura Kodenji, an actor of female roles, is walking in the rain toward a rustic cottage where a young man waits him, listening to a blind musician playing the samisen. It is raining and another actor holds an umbrella over Kodenji’s head. The plaque on the outskirts of Kyōto over the cottage reads “Ogurayama”, the name of the area where the poet Fujiwara Teika had a villa and retreat. Masanobu’s design probably refers directly to a theatrical performance which was presented in the eleventh month of 1719. Portraits of actors in a similar scene from this play were designed by Shigenaga and others and are found in the collections of the Art Institute of Chicago (Catalogue p. 188, no. 1), Toronto (Images of 18th century Japan, no. 35), and Berlin (Tōkyō exhibition catalogue, no. 5). Masanobu’s print, and the kabuki play itself, however, refer back to an earlier episode in the life of the poet when on a journey he visited the blind and exiled poet Semimaru in his isolated mountain retreat. 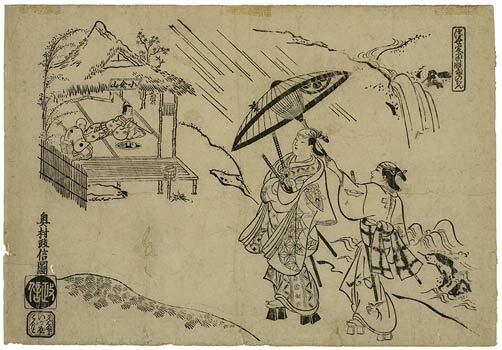 An early representation of this visit is shown in the background of an unsigned kakemono of the early 1700s where the poet with his umbrella is shown approaching Semimaru’s dwelling. An album sheet from the series Yamato no Irotake designed by Masanobu around 1705 of Teike’s Journey also shows the hut of Semimaru, with the poet-priest playing his biwa, in the distance. (Art Institute of Chicago, p. 118, no. 6). In the play this story was obviously altered, because in Masanobu’s design and in the theatrical hosoban, Semimaru is demoted to a blind musician playing for Teika at his cottage at Ogurayama. This print is rare. No other impression seems to be known. A painting which seems to be a close copy of this print is reproduced in Lane, Masters of the Japanese Print, fig. 49. Another painting, related to this design, but with several noticeable differences, particularly in the background, is in the Freer Gallery of Art in Washington (Stern, Freer Gallery of Art. Fiftieth Anniversary Exhibition. I. Ukiyo-e Painting, pl. 39.) The picture is small and unsigned, but on the strength of its association with this print is attributed to Masanobu. Reproduced in Ingelheim catalogue, no. 6.